Use the Product Bookings screen to see which opportunities a product is booked on and which assets have been allocated. From an opportunity click on the blue arrow next to an opportunity item and choose Availability from the menu. 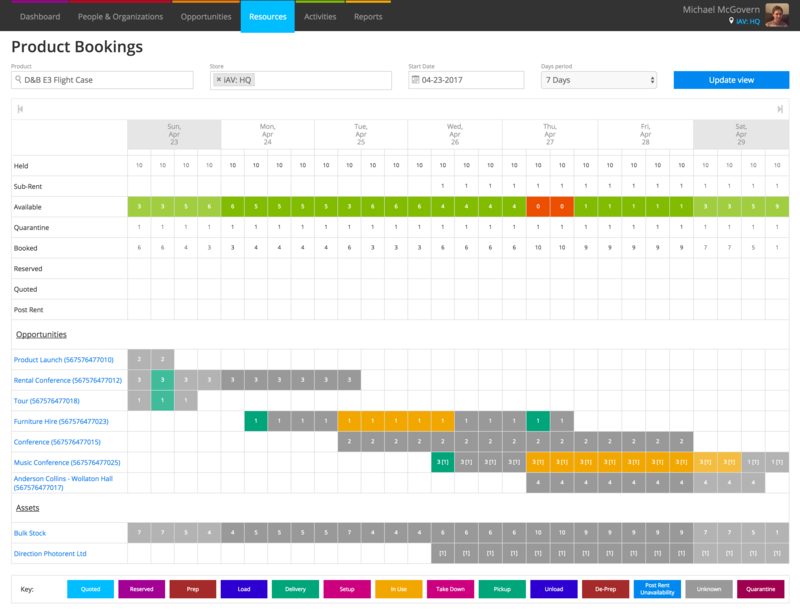 Your initial view is a breakdown of availability for the next 14 days, or for the same period that you were viewing from the Product Availability screen. A breakdown of how many items are held, sub-rented, available, quarantined, booked, reserved, quoted, and in post-rent unavailability. A list of any opportunities that the product is booked onto, along with the quantity on that opportunity. A list of any asset bookings, especially useful for serialized stock. In the opportunities section, you’ll see a list of any opportunities that the product has been added to. The number on each tile indicates the total on the opportunity. The color of the tile lets you know the status of the opportunity from dates entered in the extended scheduler. There’s a color key at the bottom of the page. The final section shows you any asset booking for this product, especially useful for serialized stock. Where assets haven’t been allocated, you’ll see “Group booking” – this means that a product is on an order or reserved quotation but you’ve not yet allocated assets. 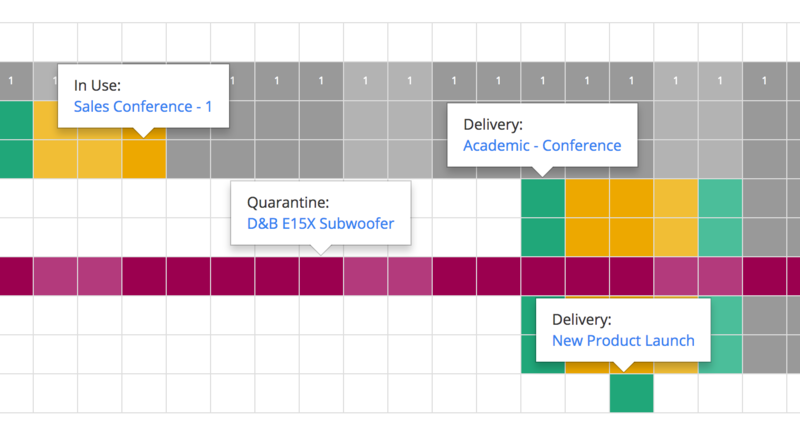 As with the opportunities section, each tile is color coded depending on the dates in the extended scheduler. There’s a color key at the bottom of the page. Click on a tile to see which opportunity (or opportunities) the asset has been allocated on. From the popup, you can click straight through to the relevant opportunity or quarantine too. If the product has stock levels that are serialized components, you’ll see a count of how many of the assets are serialized components. There’s a label linking to the serialized container.